We’ve been learning a lot about Docker, Mesos and Marathon lately at Banno and have big plans to use these technologies in our infrastructure. Mesos will let us treat all of our servers as one uniform pool of resources, on which we’ll run our applications packaged into convenient Docker containers, with Marathon figuring out the details of running these applications. Many of our applications are “reactive“, built on tools like Akka and Spray, and are thus inherently multi-threaded by nature, able to spread computations across many CPUs concurrently to speed up certain operations. When you tell Marathon to create an application for you on the Mesos cluster, you include a cpus parameter which is typically a number like 0.1 or 3. I was very curious what this parameter controlled exactly, but was unable to find it documented anywhere. It seems quite important, especially since our reactive apps will use as many CPUs as they are given. In this blog post, we’ll dig down into this cpus parameter and learn about CPU resources in Docker, Mesos and Marathon. Note: these are very fast-moving projects and the information in the post may become outdated rather quickly. It should be accurate as of Docker 1.2.0, Mesos 0.20.0 and Marathon 0.7.0. What does Marathon’s cpu setting actually mean? What does 0.1 cpus, or 2 cpus mean? How many CPUs does a process running in a Docker container on a Mesos slave think it has? How does this relate to total CPUs on the Mesos slave? How do processes running in separate Docker containers on the same Mesos slave interact/interfere/share the machine’s CPUs? First off, we need a Mesos cluster running Marathon. My colleague Nic Grayson created a great project that will run a local Vagrant box with Zookeeper, Mesos master, Mesos slave, Marathon and Docker on it, so that’s what I will use in this post. Currently it’s a private project, but hopefully we can open source it in the future. Mesosphere also provides convenient tools to set up similar clusters on AWS and Google Cloud Platform. 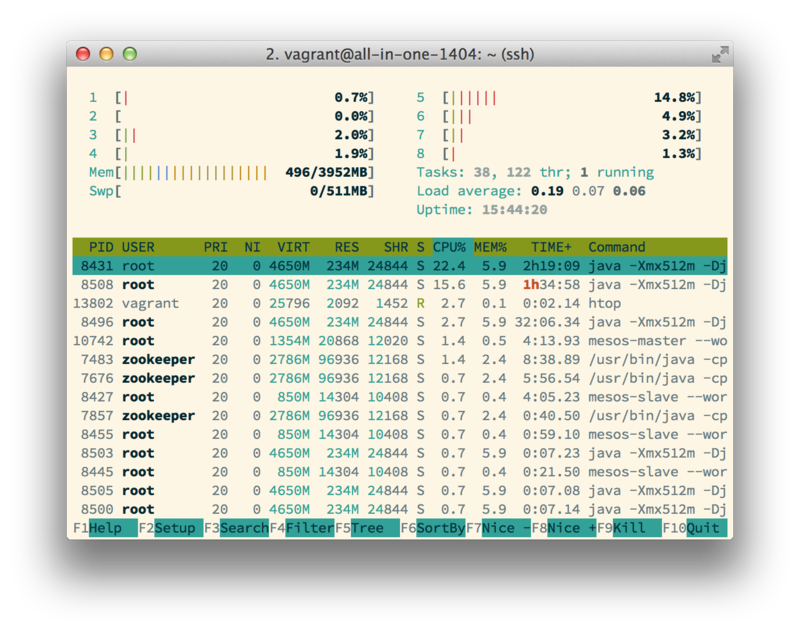 So our Mesos slave machine has 8 CPUs. Here are the contents of helloworld.json. Note that we request 0.1 cpus for this application. It may take a few minutes to pull that ubuntu:14.04 Docker image, but eventually Mesos will run the Docker container. You can see it by running sudo docker ps on the Mesos slave. So far, all evidence suggests that this container has access to all 8 of the Mesos slave’s CPUs, even though we only requested 0.1. To summarize so far, a process in a Docker container running on a Mesos slave appears to have access to all CPUs of that slave machine, regardless of the cpus parameter we submit to Marathon when creating the application. This seems great for reactive apps, as they can spread computations across multiple CPUs. So what does this Marathon/Mesos cpus parameter do exactly? Let’s take a look at how Mesos actually runs a Docker container. Mesos builds up a docker run command, converting the cpus value into a value for Docker’s --cpu-shares setting, which according to the Docker documentation is just a priority weight for that process relative to all others on the machine. So this cpus parameter is a relative weight on the priority that the OS will use when scheduling processes time on the CPUs. An application run with cpus=2 should receive twice the priority as one using cpus=1. 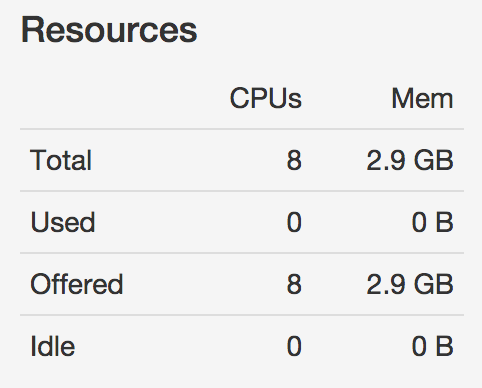 There are a total of 8 CPUs but our app is using 0.1 of them, so 7.9 CPUs are left available. 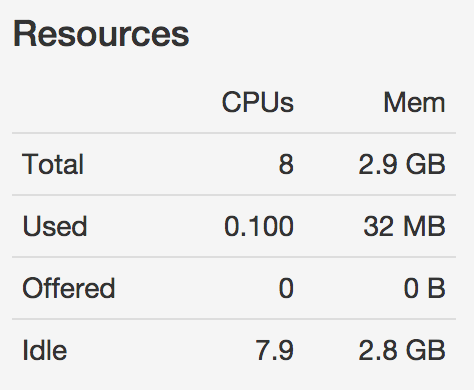 Mesos will only allow a task to run on a slave if that slave has enough CPU capacity left to accomodate that app’s requested CPU value. The remaining capacity starts off at the total number of CPUs on the machine and decreases by the amount requested by each task assigned to it. This is another effect that the cpus parameter has: it specifies the CPU capacity used up by the application. Note that this cpus parameter is not a direct limitation on the number of CPUs available to the Docker container, nor some kind of limit on the speed of the CPUs. We already saw that the Docker container could access all 8 CPUs, so when we request cpus=0.1 Mesos is not just giving our Docker container 1 of those CPUs, or 0.1 of them; it has all 8 CPUs. Mesos just seems to keep track of total CPU resources, and subtract from that capacity however much CPUs your application specifies that it needs. Given what we’ve discovered, cpus seems like a bit of a vague, or even misleading, name for this parameter. Maybe cpu-capacity or cpu-weight would be more descriptive of what it actually does? Now that we know a bit more about CPU resources in Docker, Mesos and Marathon, and the effects of this cpus parameter specifically, we can make more informed choices for its value when creating applications in Marathon. If we always choose a low value like 0.1 we risk over-allocating tasks on the Mesos slaves: we could end up running too many processes, and each process won’t get enough CPU time. If we always choose high values like 5 or 10 we risk under-allocating the Mesos slaves, leaving expensive CPUs sitting idle, or worse we may not even have a Mesos slave in the cluster with enough available CPU capacity to even run our tasks. Hopefully this has been an informative blog post for you. If I’ve missed any details or made any mistakes, please let me know in the comments! Mesos provides an API for various isolator implementations to use, and one that should be available in the future would be based on cpusets and would allow you to truly restrict a certain process to certain CPUs on the Mesos slave. Docker also exposes this functionality via its --cpuset option. This will provide additional flexibility and may be better than cpushares for certain use cases, but just like choosing the value for your cpus parameter, you would need to choose the cpuset isolation carefully or you may see low utilization. Nice research! I started to wonder when my multithreaded application gained no improvement when i increased the cpu-parameter in the marathon config. Thanks a lot! Nice research! However, can you throw some light on the default CPU values? What value will be assigned if I dont specify a value explicitly? @Rishabh I’m pretty sure you have to specify a value for cpus when creating an application in Marathon. If you omit that field, I think it will just respond with an error. The GUI probably wont allow you to leave the space empty. In case you are using a json file to post an application (say a docker based application) , in that case, CPU isn’t a mandatory field. A colleague of mine was saying it is 1 unit by default. I havent yet tried by myself.